I recently posted about the amazing resource that is the repository of fan-written Warhammer Armies books. Well, I have become obsessed (as I am wont to do) with one of these: "Nippon" by Mathias Eliasson. It's an amazing piece of work, beautifully illustrated and provides great "fluff" as well as a full army list. Moreover it has started me on a path to collecting a new army. Models for the "Special" and "Rare" sections of the army will take some finding, but those nice people at Wargames Factory have nicely supplied pretty much everything required for the army "Core" as part of their 28mm "Rising Sun" range of models. I'll start with a quick note about the sprues themselves - a rather neat feature is that all the sprues in the box are designed to very neatly stack and have pegs and holes in the corners to support this. 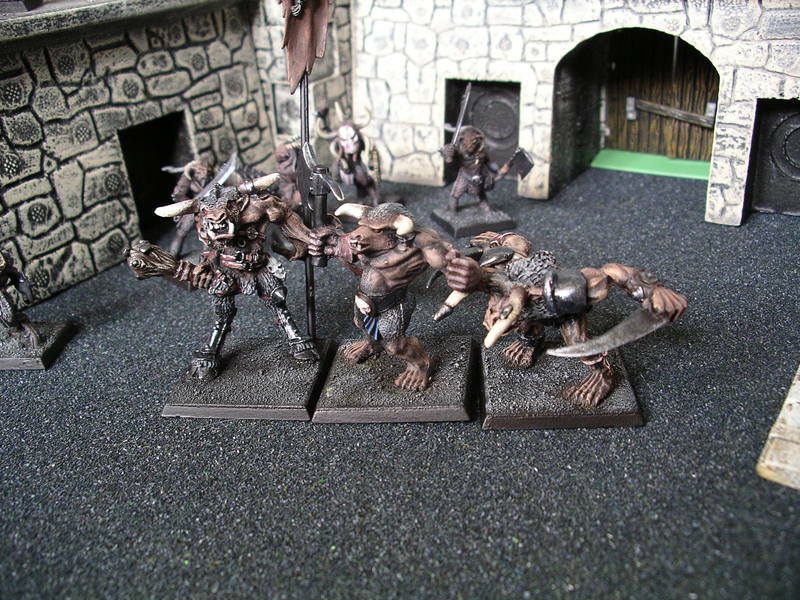 This means they fit neatly into their box and there's no danger of sprues becoming entangled in one another, rattling about or damaging each other when picked up. Very neat. The box contains either 6 sprues (5 sprues of models, one of bases) or 5 sprues and a bag of loose bases. The bases sprue stacks in the same way as the sprues of models. 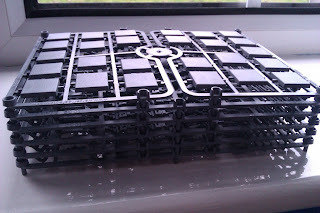 The bases are simple 20mm x 20mm square tiles with the Wargames Factory logo embossed on the bottom. 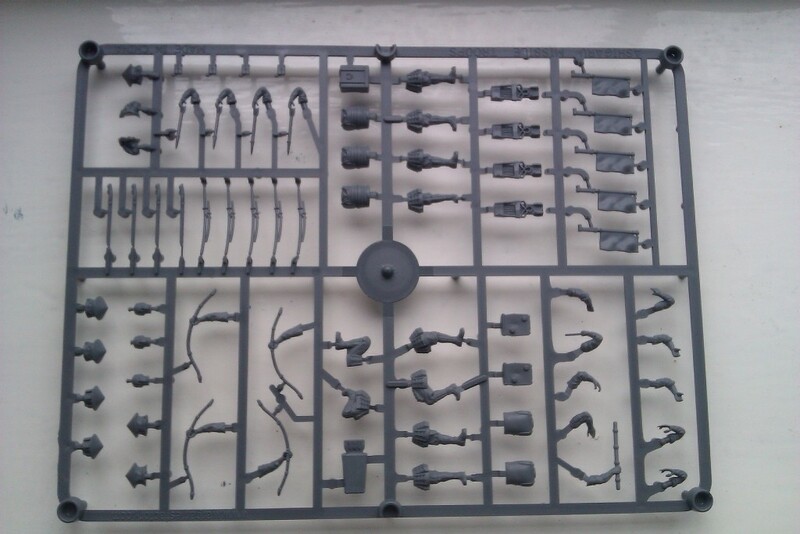 The model sprues contain parts for 5 models with each arm, leg, torso-front and torso back being a separate piece. This enables a variety of possible poses. 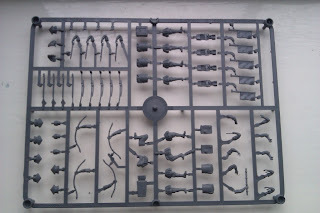 Coupled with the fact that each sprue contains a surfeit of heads and equipment (katanas, quivers, ammo pouches and so on) and there's lots of scope for assembling the models in a variety of ways. So there are enough parts in the box to assemble 25 models. The only limitation seems to be that the number of weapons supplied is sufficient to assemble only 20 archers or 20 matchlock riflemen (so you can build 20 of one type and then have to "mop up" by building 5 of the other). This is a little odd, but for my purposes doesn't really matter as I've bought two boxes. The quality of the models is good and given that you get 25 models for an outlay of around £16, this set represents excellent value for money. Well recommended. 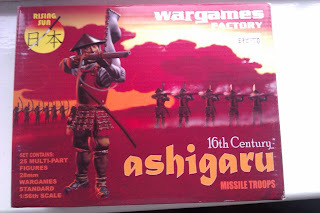 Other posts will follow in the next few days regarding other Wargames Factory products from their "Rising Sun" range. I'm no photographer, but I do like to think I do a good job of painting my models and I wanted to show off my models on this blog. I spent some time taking bad, blurry photos (if you've looked over this blog you will no doubt have seen some of them!) before I hit on a simple method of taking clear, photos very simply. I don't know what an f-stop is, I have no idea how to use lenses or light meters or adjust shutter speeds (or why you'd want to do so) so you won't find any complex instructions on this page. This is a quick, simple and "good enough for me" guide. Update: I originally wrote this post in mid 2013 and received a number of valuable items of feedback as a result. I've included a couple of those that were simple to achieve (or at least to look into - I don't know what kind of cameras you have out there) as they can make a significant difference to the results you get. Credits to the suggesters are given along with the updates, which are (like this paragraph) highlighted in cyan. My first item of advice is "use a real camera" as opposed to a camera-phone. There's one simple reason for this, which is that you want something that will hold still (see the next section about the mini-tripod) and mobile phones don't lend themselves to that very well. For most people who will - like me - be uploading their photos to a website, the "megapixel" rating of the camera is probably not of great concern. Chances are you'll need to shrink your photos anyway as they'll be too large to fit on a screen and too big to get very many on your website/blog if you don't. I'm using an old Pentax 5MP camera that I got off eBay few years ago for £20 (around $30). It's nothing special - just a basic camera. This is important - you need the camera to be as stable as possible. You will be close to your minis and the slightest wobble will be magnified by proximity into a big blur. 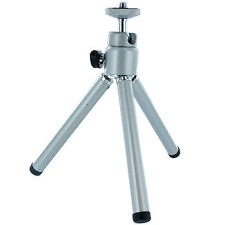 I bought a mini-tripod from a UK store called "Poundland" where everything costs just £1 (around $1.50). It's brilliant. Similar things are available from eBay and Amazon. If you can't find on of these, just rest your camera on the table or on a book - anything that gets it where you want it to be and holds it more still than you can with your hand. This is also important. Being close up to your models needs your camera to focus in a particular way. 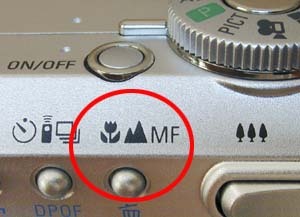 Most modern cameras can do this quite easily as they have a "Macro button" specially for the purpose. Just press it, your camera will do all the rest. Update: Not too close though! Hanska at Bolter and Chainsword made a good suggestion: "Why take pictures too close to the mini? Even with macro there is something called minimum focus distance, and way too many people take pictures too close so the camera can only focus on the background, leaving the mini really blurry. I take pictures from about 40cm distance and just crop them with the same software I resize the to net friendly size." Another good suggestion from Hanska at Bolter and Chainsword:Your camera probably has a function whereby you can press the "shutter" button and it delays for a pre-set period before taking the snap (so you can dash round and get your mug in frame for a "selfy". You can use this feature to eliminate even more "wobble" - put a small delay of say - 2 seconds in place to give your camera time to stop shaking from the business of having been touched when the button was pressed. Purely down to personal preference - put your model in a context that will show it off to its best advantage. For you this might be to place it on a sheet of coloured paper with another sheet behind it (preferably curved slightly around it) or it might be in a scene or vignette with other models and scenery pieces. Whatever works best for you. Lastly, make sure your model is as well lit as possible. Daylight is great but artificial light can work well too. At all costs, though, try and avoid using a flash (turn off your camera flash if it has one) as when your camera is very close to a model, the flash will totally overwhelm it. "Learn to use your white balance. Daylight vs. light bulbs will actually change how your camera sees colours slightly (we don't notice as much because our eyes adjust automagically) but a camera doesn't. My camera simply has options for what type of lighting you are in and it adjusts from there to the proper colours. This made a huge difference for me as one of my colours looked very blue in pictures but was actually more green /teal and playing with the white balance fixed this." I said it was simple. You can try different types of lights, lights of different colours and so on. Experiment. Find out what works for you. Here are a few pics I took using this technique (remember: not all the photos on my blog were taken this way so don't judge the technique by the quality of every photo here). I've just found an amazing website with what must be the most detailed Map of the Warhammer Old World that has ever been produced. Apparently, if printed off in its full resolution it would literally cover walls (plural, and I believe it!). It has a fantastic Google-Maps type interface and is a must-have resource for anyone role-playing in the Old World. Check it out: Gitzmans "Super-Huge Detailed Map Of The Warhammer Old World"
The rest of the site is well worth a look too! My friend Mike and I recently played a 2500 point "Cities of Death" game at Warhammer World on their "Mega Bastion" table. It was a thoroughly enjoyable day and a thoroughly enjoyable game. 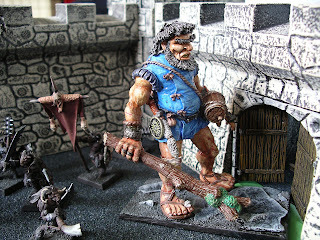 Mike has done a great job of writing the game up over on his blog "The Old Giant" with many, many great photos. Here's a link to the Battlereport. I've just discovered what I think is the most amazing resource for a Warhammer gamer who wants to try something a little different. Linked here (and also in my Links pane) is a Blog which exists to produce Warhammer Armies "books" written by fans of the game in order to detail some of the regions of the Warhammer World not covered by GW in their official supplements. A supporting Forum can be found here (and in the Links pane). The books are all completely unofficial, but seem to be of very, very high quality and are freely downloadable. and many, many more besides. If you're looking to try something different I'd highly recommend checking them out. Please note: you will almost certainly need to "spread out" and include models in your army which are *not* Citadel Miniatures. Also, as the rules are all unofficial, I'd recommend you discuss their use with anyone you intend to game with and also understand that they may well not be permitted for tournament play.